Vitamin D is one of the first nutrients that mainstream health authorities will tell you is hard to get on a vegan diet. The truth is, vitamin D deficiency is not a vegan problem—it's a modern world problem. Pretty much no one gets enough, because like you and me at this very moment, the only rays we're all getting are from a computer screen...wah, wah. I've read a range of various studies which report that anywhere from 50-90% of Americans are deficient in vitamin D, even Hawaiian surfers. The language of the warning, too—that it's hard to "get" vitamin D—is misleading, clouding a better understanding of how D works, and how humans can bolster our stores without eating animals. Rather than something our bodies get from meat or dairy, vitamin D is something that our bodies produce on their own in a reaction with the sun. It's a beautiful phenomenon, really, this connection between our bodies and the sun. I like to think of humans as solar beings in this way, designed to have the sun on our skin. The key to this vitamin D reaction, however, is our body's store of cholesterol—that's why vegans are reportedly low. Cholesterol in our skin + the sun = D3. Knowing this, one could deduce that any sufficiency in the American public is due to an overabundance of easily sun-accesible cholesterol. Remember, also, that many standard staples like milk are fortified with D3 because the mainstream food supply, including warehoused animals, is so deficient in the first place. Plenty people who are sufficient in D are so for that reason alone. Since most of us don't get naked in the sun enough (is there such thing as enough in this case? ), and since we're generally low in cholesterol, here's a new short, easy-to-understand interview with David Wolfe about the importance of vitamin D as well as the new LICHEN-BASED formula available at Longevity Warehouse (yay!). This is SUPER exciting news since until recent history D3 has been sourced from lanolin, basically sheeps' skin grease. So. Gross. Who comes up with this stuff. Like I always say, going on a plant-based diet helps turn our attentions toward deficiencies we may never have corrected otherwise. So hooray for veganism's interest in D3 and creating a demand for a cruelty-free source! Longevity Warehouse is giving us 10% off their vegan D3! P.S. For kids, pinch or bite open the tiny round liquid capsule—if they won't swallow or chew it up themselves—and sip out or squeeze onto a spoon (I pretty much always break open capsules anyway to avoid the extra filler ingredients). Vitashine also offers a lichen-based D3 spray for extra ease with little kids. Have you seen your D3 levels increase due to another lichen-based formula? Report in the comments below, please! "Well, I only eat a little meat these days...everything in moderation, right?!" That's a little bit kinda sorta the attitude my own stinkin' brain—psssh, not me, of course!—was having about bread while I listened to Dr. William Davis, author of Wheat Belly, speak at Longevity Conference a couple weeks ago. Dr. Davis reported, as we've heard before, that two slices of whole wheat bread can raise your blood sugar levels higher than 6 teaspoons of white sugar can—even despite the good fiber. The little wheat-devil's advocate on my shoulder argued, "Well, I don't feel a sugar spike from bread like I do from even a little cup of vegan ice cream, so Dr. Davis can get lost." "But," I shook my finger, "when we eat bread, we crave bread and you know it. We get that addictive urge that's associated with sugar, so stop pretending like you didn't just hear some helpful facts. You sound like a meat-eater." So, basically...even though raw foods make up the bulk of my meals anyway, and even though I only buy a loaf of rustic, dark, crusty-on-the-outside-bubbly-on-the-inside bread every once in a blue moon (I mean, for God's sake, my parents live in San Francisco. Have you had a loaf from Tartine?! )...I haven't eaten any wheat since the conference almost a month ago. And I'm not even mad about it. I'm not saying I'm off wheat forever—after all, unlike meat, eating bread in moderation won't hurt anyone but me—but I am taking heed and being open-minded to the facts. I want neither a meat nor wheat belly. In the 1970s, the wheat genome underwent a "rapid and significant change" as scientists aimed to solve world hunger through hybridizing wheat to produce larger seed heads and heartier stalks. The new genetics of wheat, further altered by agribusiness' use of pesticides, have resulted in a grain with proteins called "gliadins"—essentially indigestible by humans and associated with ADHD, mania, depression, mind fog, and food obsessions (hello, wheat-devil's advocate!). When your blood sugar reaches high levels, your body begins to alter its own proteins. This is called "glycation." Low-grade glycaction is normal, but high glycation, over many years, can cause cataracts, wrinkles, age spots, brittle cartilage in the joints, hypertension, heart disease, cancer, and dementia, not to mention a buildup of visceral fat (AKA "wheat belly" around the tummy/love-handle area). When you choose gluten-free products, look out for main ingredients like potato and corn starch—these raise blood sugars levels even higher than wheat. Ingredients like almond or coconut flours, and ground nut meals are better choices...and the market is slowly changing to accommodate. My advice: There's no arguing that today's wheat is product of GMO tinkering. But if you're going to eat it (and note that Dr. Davis recommends complete "wheatlessness"—organic or not), lessen the load, choose sprouted grain breads, and balance your meal with a lot of greens, fiber, and/or fats like olive oil or avocado to slow the stream of sugar going to your blood. Nopal cactus supplements and cinnamon are both known to regulate blood sugar levels. And if your aim is superior, ultimate, mind-boggling health, I'd say buh-bye to wheat. Just up your greens intake and find a new salad dressing you love. It's working for me (at least until I go to San Francisco). 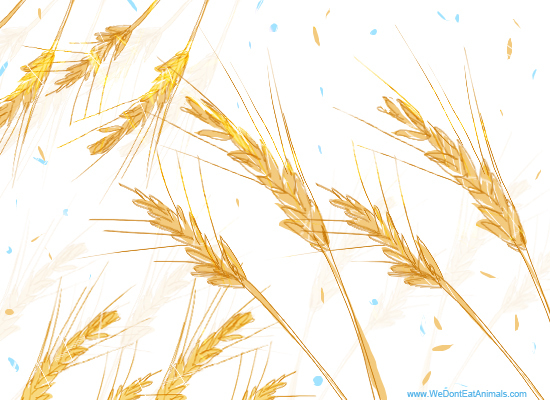 Are you eating less or no wheat these days? Tell us all how you feel in the comments below!